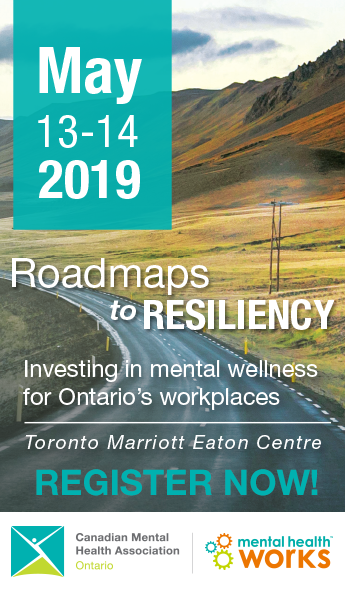 (Toronto, Feb. 28, 2019) – Mental Health Works – a national social enterprise led by Canadian Mental Health Association, Ontario Division – has a new, free resource developed by experts in the field that will help employers and managers of Ontario businesses looking for ways to address mental health in the workplace. Mental Health in the Workplace: An Accommodation Guide for Managers and Staff outlines key skills employers and managers in Ontario workplaces should have when an employee presents a mental health concern. The guide is divided into three parts that are intended to build awareness around mental health concerns and mental illnesses, teach appropriate responding skills, and inform organizations on ways to collaborate with employees to make the workplace more accessible. This new resource was developed as part of the EnAbling Change program, an initiative of the Accessibility Outreach & Education Unit, in partnership with the Ontario government. It’s meant to orient employers and supervisors to their responsibilities under the Accessible Employment Standard and provide workers in Ontario with practical techniques on how to request accommodation. Every week, 500,000 Canadians will miss work due to a mental health concern. One in three Canadians will experience a mental health concern in their lifetime. 30 per cent of all disability claims are related to mental health. Canadian Mental Health Association (CMHA), Ontario is a not-for-profit, charitable organization funded by the provincial Ministry of Health and Long-Term Care. We work to improve the lives of all Ontarians through leadership, collaboration and continual pursuit of excellence in community-based mental health and addictions services. Our vision is a society that embraces and invests in the mental health of all people. We are a trusted advisor to government, contributing to health systems development through policy formulation and recommendations that promote positive mental health. Our 30 local CMHA branches, together with community-based mental health and addictions service providers across the province, serve approximately 500,000 Ontarians each year. Mental Health Works is a national social enterprise of the Canadian Mental Health Association (CMHA), with the head office at CMHA Ontario Division. We provide workplace mental health training to organizations nationwide. Mental Health Works is dedicated to advancing the field of workplace mental health through skills enhancement training, awareness education and stigma reduction efforts. For more information, visit: http://www.mentalhealthworks.ca/.